A trade pact between China and Taiwan, widely seen as the most significant agreement since civil war divided them in 1949, has come into effect. The Economic Co-operation Framework Agreement (ECFA) cuts tariffs on 539 Taiwanese exports to China and 267 Chinese products entering Taiwan. The majority of people in Taiwan expect the deal to bring economic benefits. But opponents fear it will make the island too dependent on China, which still considers it a renegade province. The deal is seen as the culmination of efforts by Taiwan's President, Ma Ying-jeou, who has vowed to reduce tension. Last month, the island's parliament approved it without a single dissenting vote, despite protests from hundreds of thousands of people and an ugly scuffle between MPs from the ruling and opposition parties. It is hoped that the ECFA, signed by Chinese and Taiwanese leaders in June, will boost bilateral trade that already totals $110bn (£73bn) a year. 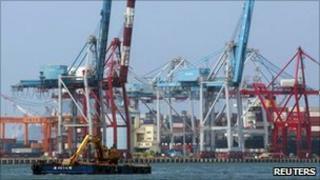 Almost $14bn of Taiwanese goods exported to China will have their tariffs reduced or removed. Chinese exports worth just under $3bn will enjoy lower or zero tariffs. Beijing agreed to tariff cuts on half as many products to appease opponents to the agreement who said it might lead to Taiwan being flooded by cheap Chinese products, damaging local industries and leading to job losses. The Taiwanese government has said it believes the ECFA will help create 260,000 jobs and boost economic growth by as much as 1.7%. "This will not only have a wide-ranging influence on the future development of ties between China and Taiwan," Lo Chih-chiang, a spokesman for President Ma told Taiwan's Central News Agency. "It will also help further consolidate peace and prosperity." China's commerce ministry said it was pleased the ECFA had taken effect. "We believe the implementation of the pact will further promote exchanges and co-operation in cross-strait trade and help the economies develop together," spokesman Yao Jian said in a statement. The BBC's Cindy Sui in Taipei says the Chinese and Taiwanese governments are shortly expected to begin negotiations on further trade deals which could allow even greater access to each other's markets. Analysts believe this trend could help reduce tensions between the two sides, which have yet to sign a peace treaty.